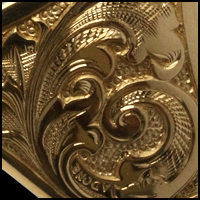 LVX-C Hand Engraved custom signet Ring: Rings carry significant meaning to most people and a hand engraved signet ring or wedding band enhances its sentiment and more so adds a unique and refined look that tastefully enriches its wearer. 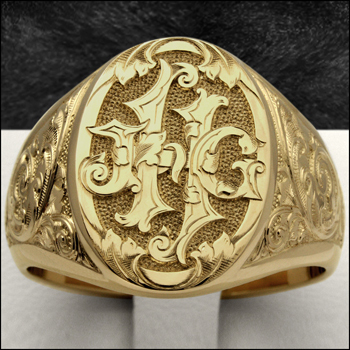 LVX-C custom signet rings exceeds typical standards in decorative ring design and is lavishly executed in an exquisite Victorian styling that simply compliments any monogram, coat of arms, personal crest, or Freemason symbol. Each ring is crafted with passion and hand engraved to exacting standards resulting in a crisp and brilliant sparkle that emanates from every incised cut and contrasts by natural shadow. Together reflection and umbra form the striking beauty that can only be found in fine luxury hand engraving. Luxury hand engraved signets and custom watches. Coat of arms crest rings and engraved wedding bands bracelets engraved. 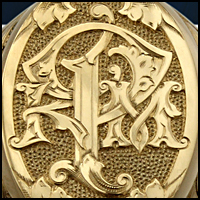 Family crests jewelry engravings, monogram ring engraver and quality Masonic Jewelry engraved signet rings in Gold.